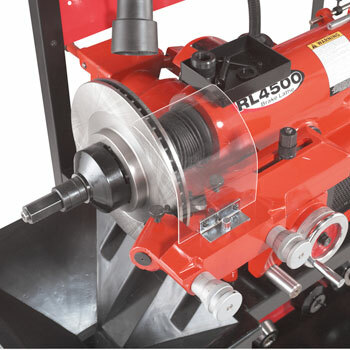 The rugged built Ranger RL4500 complete lathe package is an excellent value that includes lathe, bench, adapters, and other helpful accessories. You won’t find a better brake lathe that will provide a faster, more accurate, or easier resurfacing capability anywhere. The RL4500 is equipped with features that help increase your service capability, like precision twin cutter tools and a quick drum-to-rotor changeover. A variable speed spindle and two-speed cross feed setting allows for easy rough and finish cuts. The RL4500 supports drums or rotors up to 120 lbs. using the standard arbor. The precision lathe allows you to work quickly and efficiently because simple ergonomics are designed for minimal operator movement. 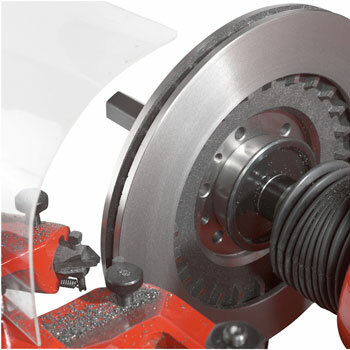 Ranger brake lathes will maintain their accuracy year after year thanks to their rugged construction. Forged, hardened and precision ground components resist grooving and wear and massive tapered spindles offer superior weight support during rotation. Our exclusive “splash-lube” oil-feed system supplies a constant flow of oil to the bearings making sure they provide years of trouble-free service. 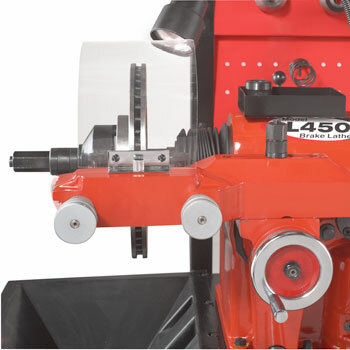 This RL4500 is flexible enough for both high-torque, heavy-duty cutting as well as your finest finish cut operations. The legendary control of our RL4500 makes it easy to learn and simple operate. Ranger™ offers an abundant menu of accessories and tooling that allows you to fully tailor your machine to your specific needs. But long before you start looking at options, you'll be impressed with the long list of standard features and capabilities packed into every Ranger lathe. These features and capabilities are normally found only on machines costing thousands more – and some aren't available anywhere else. Every Ranger lathe is designed to provide the features and performance you need – making it the soundest investment you've ever considered, and providing more utility, flexibility and productivity than you've ever imagined. Heavy-Duty Bench Comes Standard - While others charge extra, we include this sturdy steel bench with large tool storage backboards allowing you to hang all adapters within easy reach. A durable multi-compartment toolbox provides storage for all adapters and accessories. Large chip “catch” funnel and chip bin keeps work area clean and safe. Easily Change From Rotors to Drums - A convenient quick change tool head design allows operators to quickly change the setup from drums to rotors and vice-versa. Up-front controls are designed for minimal operator movement. A handy tool tray is located near the front of the machine so you can keep your favorite brake lathe tooling within easy reach. Fully Equipped Adapter Package - Includes micro-dial twin tool cutter, boring bar, inside floating adapters, self-aligning spacer, outside floating adapter, centering cones, spacers, double taper adapters, hubless adapters, carbide cutting tools, 6-sided carbide cutting inserts, 1" arbor, arbor nut, back load spring, spare bulb for lamp, illustrated instruction manual, wrenches, high-impact anti-vibration bands and plastic storage case. A Tradition of Service - Superior quality, durability and precision. That’s what makes Ranger the growing choice of professionals worldwide. Whatever your brake service needs are, you can rely on Ranger to deliver the right equipment for the job. As a preferred supplier of quality automotive service equipment, our goal is simple: give our customers the best quality and value, and provide unparalleled service and support. Why does Ranger offer you so much more? Because we don’t just believe in developing superior products, we believe in creating solutions that make your job easier. Simple. Durable. Trouble Free. 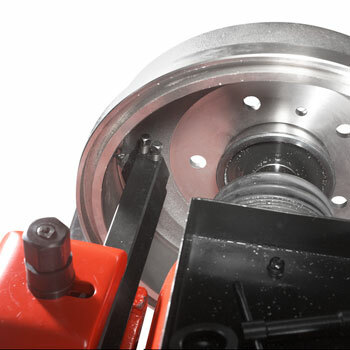 - Ranger brake lathes are easy to operate and durable enough to withstand every day abuse, especially in a busy shop environment. A super-heavy cast iron body, forged, hardened and precision ground components and massive “floating spindles” make this one of the toughest, most dependable and trouble-free machines you will ever own. Safe and Easy to Use - Our sensible ergonomic design means easier operation and allows you to work quickly and efficiently. Simple up-front controls are designed for minimal operator movement. Large bench with tool storage boards provide ample space for adapters and accessories. A Proven Design That Will Perform Year After Year - Since its introduction nearly four decades ago, the design of our RL4500 has been a favorite of brake technicians everywhere. And for good reason. It's simple, it's fast, it's very precise and runs forever. It features our twin cutter tool head with micrometer dials and quick drum-to-rotor changeover. Adjustable speed settings allow you to rough cut rotors fast or slow cut rotors fine smooth. An infinitely adjustable spindle-feed gear box provides variable speed settings providing finish cuts that meet or exceed factory specs. Our negative rake tooling yields one pass finish cuts every time and the standard 1” arbor provides you a multitude of tooling and adapter choices from either Ranger or other aftermarket suppliers. 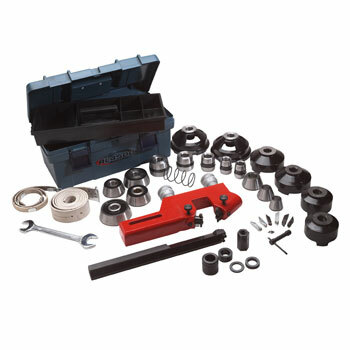 Fully Equipped Package - Includes micro-dial twin tool cutter, boring bar, inside floating adapters, self-aligning spacer, outside floating adapter, centering cones, spacers, double taper adapters, hubless adapters, carbide cutting tools, 6-sided carbide cutting inserts, 1" arbor, arbor nut, back load spring, spare bulb for lamp, anti-vibration bands, illustrated instruction manual, wrenches and multi-compartment storage case. Bench Included - While others charge extra, we include this sturdy steel bench with large tool storage backboards. Durable Work Lamp - Keeps your work lighted even in dark corners of your shop. Separate switch means you can turn off or on at your convenience. Quick-Change - Quick drum-to-rotor changeover. Safety Shield - Clear Plexiglas safety shield for user safety. Standard Arbor - A 1” arbor provides you a multitude of choices for tooling. Let The Chips Fly - Large chip “catch” funnel and bin keeps work area clean and safe. Simple Convenience - A tool tray is located near the front of the machine. Keep your favorite brake lathe tooling within easy reach. Adjustable Stop - Position the cross feed stop so the lathe stops automatically after the cut is made. Variable Speed Gearbox - Variable speed settings for finish cuts that meet or exceed factory specs. Built To Last - Rugged cast iron body and precision ground components. 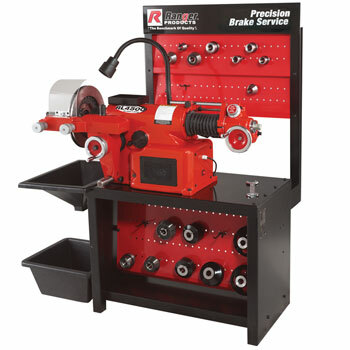 Complete Brake Service - From Start To Finish Our rugged built RL4500 complete lathe package is an excellent value that includes lathe, bench, adapters, and other helpful accessories. You won’t find a better value that will provide a faster, more accurate, or easier brake service capability anywhere. One Cut Finish - A one cut finish can be made with our negative rake twin micro-dial twin tool cutters. The Need For Speed - A “fast” and “slow” control knob and multiple belt settings gives you a variety of speed choices. Truck Adapter Set - Our super duty adapter package consists of an upgraded 1-7/8" arbor and a wide variety of adapters. This enormous 36 piece set allows you to expand the coverage to handle virtually any vehicle through 1-ton trucks.